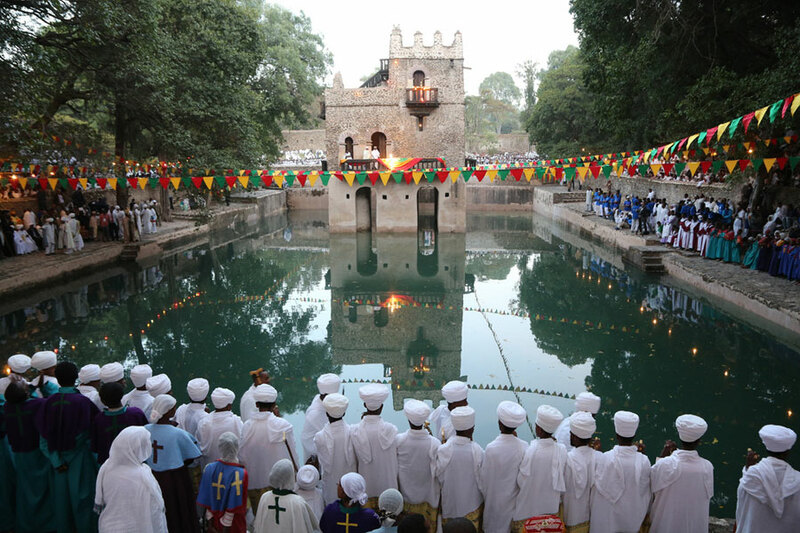 Falls on November 30th, the festival, that is attended by tens of thousands of people from all over Ethiopia, making it one of the most joyous annual pilgrimages in Axum, the “sacred city of the Ethiopians”. As the Virgin is one of the most venerated of all religious figures in Ethiopia, about 33 days are annually dedicated to different celebrations in the commemoration of Saint Mary. “Hidar Mariam Zion” is associated with the presence of the Ark of the Covenant in Axum and the belief that the Ark itself is a symbolism to her womb. The festival of Meskel has been celebrated in the country for over 1,600 years. The word actually means “cross” and the feast commemorates the discovery of the cross upon, which Jesus was crucified, by the Empress Helena, the mother of Constantine the Great. The original event took place on 19 March 326 AD, but the feast is now celebrated on 27th of September. Many of the rites observed throughout the festival are said to be directly connected to the legend of Empress Helena. 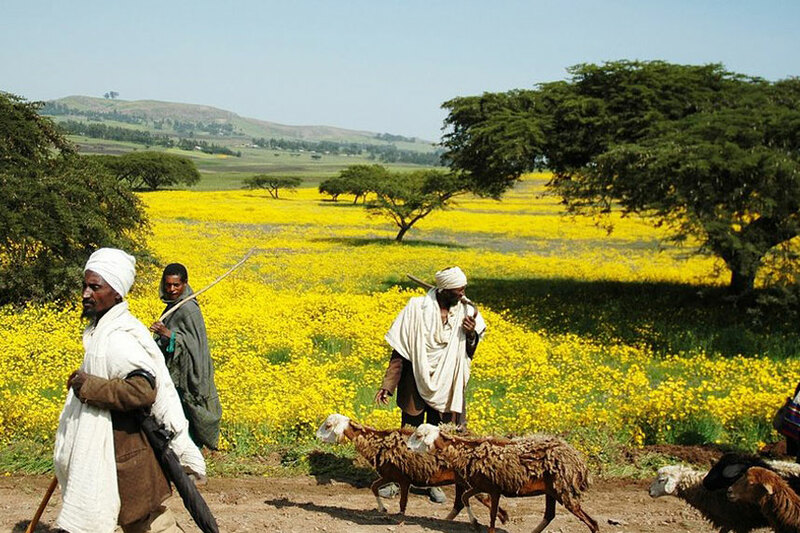 On the eve of Maskel, tall branches are tied together and yellow daisies, popularly called Meskel flowers, are placed at the top. During the night, these branches are gathered together in front of the compound gates and ignited. This symbolizes the actions of the Empress whom, when no one would show her the Holy Sepulcher, lit incense and prayed for help. Where the smoke drifted, she dug and found three crosses, to one of them, the True Cross, many miracles were attributed. During this time of year flowers bloom on the mountains and plains and the meadows are yellow with the brilliant Meskel daisy. Dancing, feasting, merrymaking, bonfires, and even gun salutes mark the occasion. The festival begins by planting a green tree on Meskel Eve in town squares and village marketplaces. Everyone brings a pole topped with Meskel daisies to form the towering pyramid that will soon be a beacon of flame. Torches of eucalyptus twigs called chibo are used to light the bundle of branches called Demera. 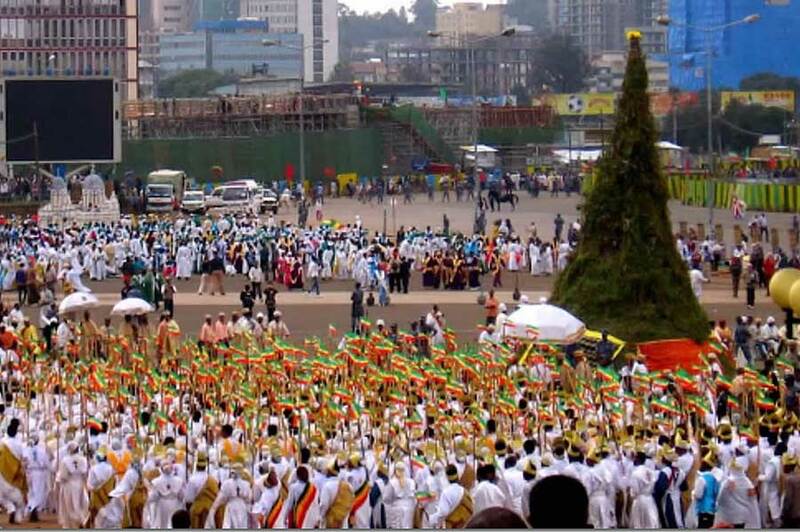 In Addis Ababa celebrations start in the early afternoon, when a huge procession bearing flaming torches approaches Meskel Square from various directions. The marchers include priests in their brightly hued vestments, students, brass bands, contingents of the armed forces, and bedecked floats carrying huge lit crosses. 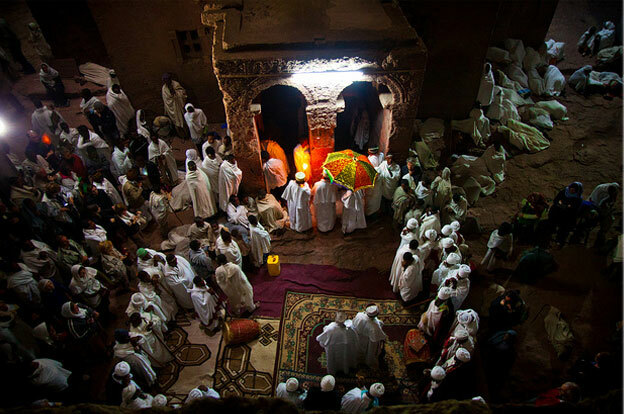 They circle the Demera and fling their torches upon it, while singing a special Meskel song. Thousands gather at the square to join in and welcome the season of flowers and golden sunshine called Tseday. As evening darkens, the flames glow brighter. It is not until dawn that the burning pyramid consumes itself and the big tree at the centre finally falls. During the celebrations, each house is stocked with tella, the local beer, and strangers are made welcome. Saint Gabriel is the Patron Saint who guards over homes and churches. 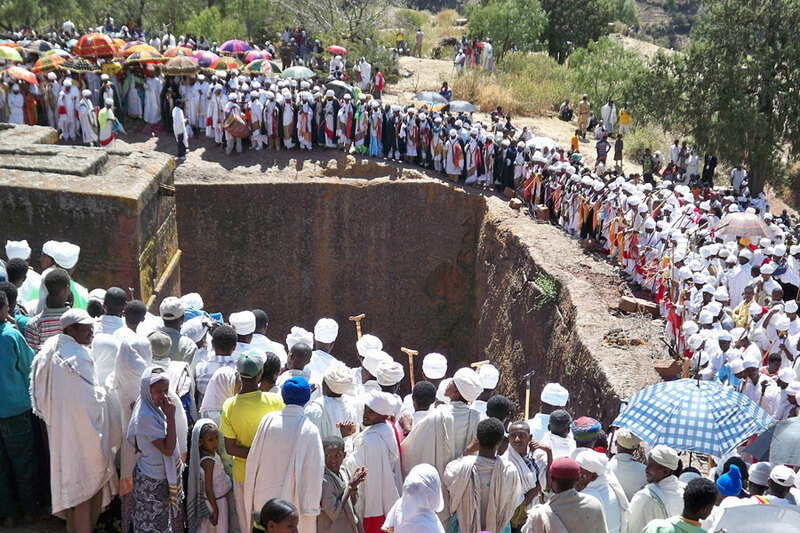 There is a huge pilgrimage at every December 28th to Saint Gabriel’s Church on Kulubi hill, which is on the route from Addis Ababa eastwards, about 70 kilometers before Dire Dawa. Many pilgrims carry heavy burdens as penance, children are brought to be baptized, and offerings are made to be distributed to the poor. Ethiopian Christmas falls on 7th of January, the faithful attend all night church services, often moving from one church to another. The traditional game of Genna (a kind of hockey) and some times “gugs” (a kind of polo) are played along with horseracing. Priests don their regalia; Lalibela is considered the best place for Christmas. 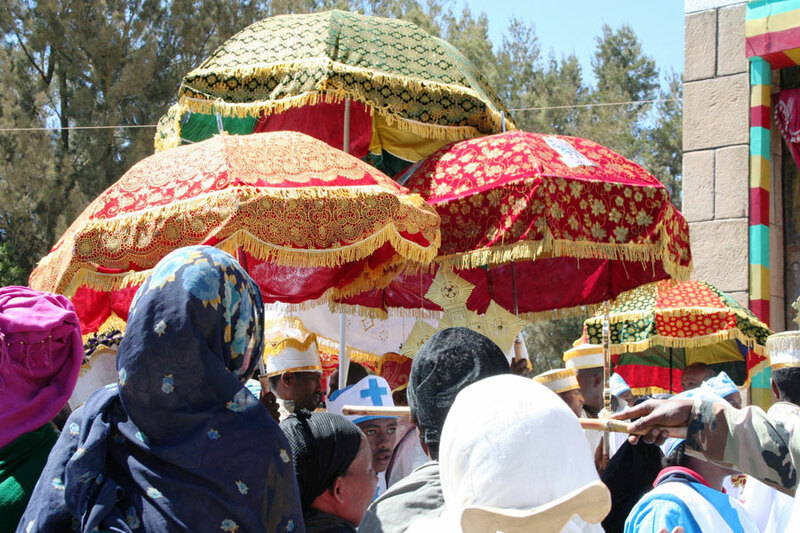 Timket; Ethiopian Epiphany, is one of the colorful holiday commemorates, Jesus Christ’s baptism by Saint John in the Jordan River, celebrate by the Ethiopian orthodox church faithfully every year, in January 19, two weeks after Ethiopian Christmas. It is three days fest starting from the eve of Timiket, in January 18, called Ketra, colorful procession and ceremonies; continue until the holiday ends on January 20th. On the eve of the holiday, priests take the Tabot, the replica ark of the covenant, containing the Ten Commandments from each church to the nearby open space. The Tabots [replica ark of the covenant] concealed by an ornamental cloth are taken to the tent close the consecrated pool or steam. They are accompanied by ringing of Bells, blowing of trumpets and the burning of incense all the way from their churches to the place they spend the night. At dawn the priest extinguishes a candle burning on a pole set in a nearby pool or steam using a ceremonial cross, some of the congregation leaps into the pool, while others looking for slashing by the priest. The Tabots are then taken back to the churches in procession accompanied by equestrian, while the festival continues. Despite being an exclusive religious festival, the holiday has been used to select brides for many families who still abide by cultural marriage. Easter is the most important annual religious feast for the Ethiopian Orthodox Church followers; commemorating Jesus’ resurrected from the dead on the third day after his crucifixion and celebrates after 55 fasting days in which no animal product is eaten. On Easter eve people go to church with candles to celebrate, which are lit during a colorful Easter mass service, which begins at about early midnight Ethiopian time. After the completion of the mass, people go home to break their feast with the meat of chicken, slaughtered the previous night, accompanied with injera and traditional drinks called tella local Ethiopian Beer or tej, honey win. Like Christmas, Easter is also a day of family reunion, an expression of good wishes with exchange of gifts like lamb, goat or loaf of bread.